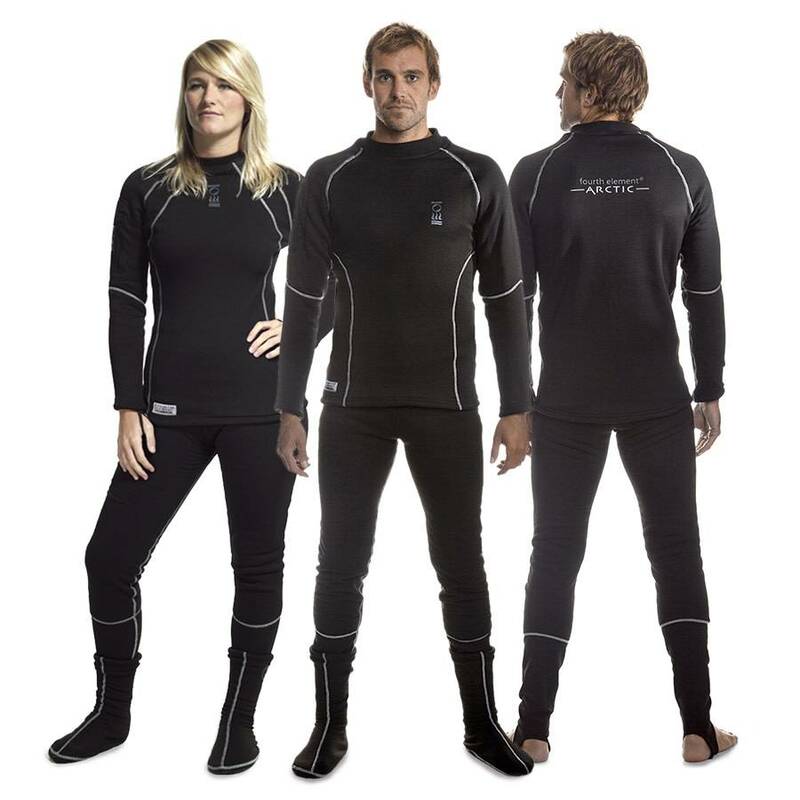 The Fourth Element Arctic undersuit is our most popular thermal protection suit and is used by Dive Academy staff and in our school. It is a warm, low bulk and low buoyancy undersuit which works even when wet. The Arctic’s two layers of high insulation, low bulk fabric ensure exceptional levels of thermal protection. Constructed with comfort and ease of use in mind, the simple design provides outstanding performance under closer-fitting neoprene drysuits and is also ideal for layering with membrane and trilaminate drysuits. The Arctic uses a combination of fast wicking, high insulation fabrics to creates a micro climate around the diver to ensure that your body stays dry and warm throughout the dive. A high density inner fleece provides superior insulation with maximum comfort and wicking. The outer layer, with its water-repellent finish, ensures a snug fit. Arctic leggings feature secure foot loops to keep leggings in place when donning the drysuit. A high waistband ensures that separation of top and leggings is minimised. We suggest that you tuck the top into the waistband before donning the drysuit. The lower legs are single layered to prevent too much bulk around the ankles, making donning easier. The Arctic retains a significant degree of its thermal performance when wet, and divers have found it possible to complete dives in relative comfort after even the most fundamental drysuit failures. In some cases, divers have not noticed a leak in a neck or wrist seal until after the dive thanks to the Arctic's high performance standards.